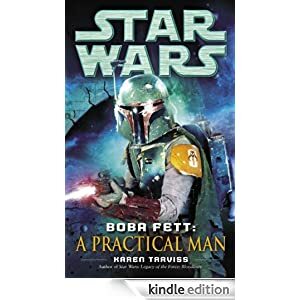 Mandalorian | Damian Trasler's Secret Blog - Do Not Read! What are you supposed to do as a hobby when your real job is something other people do as a hobby? When I was a kid, one of the things I wanted to do was work in the movies. Specifically, I wanted to work in Special Effects. 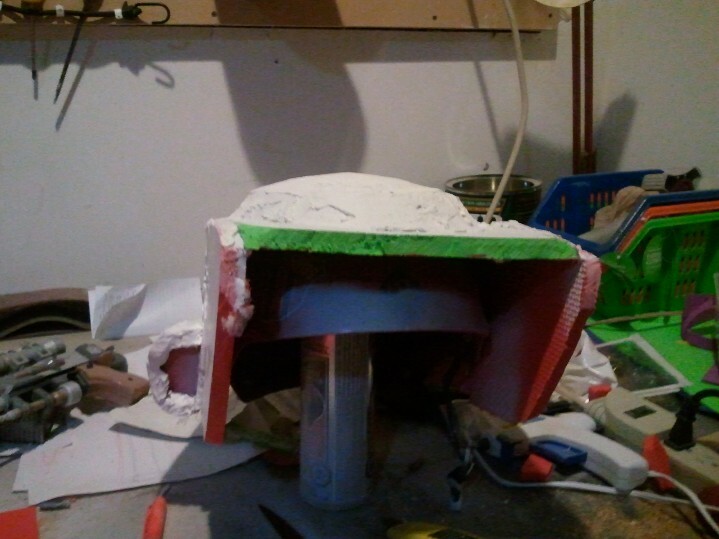 Back in those days, that meant modelmaking, creating real props, and, occasionally, blowing stuff up. When I was eighteen, I actually had the chance to visit a real effects workshop, and saw some of the machinery they had. They even owned their own fire engine to produce rainstorms when the weather wasn’t co-operating with filming schedules. More sobering was the owner’s right hand, missing two fingers after an effect went disastrously wrong. But I didn’t get into the movie biz, and modelmaking does not suit my short attention span. Every model I make ends up looking like it was hit by anti-aircraft fire, even when they’re sailing ships. 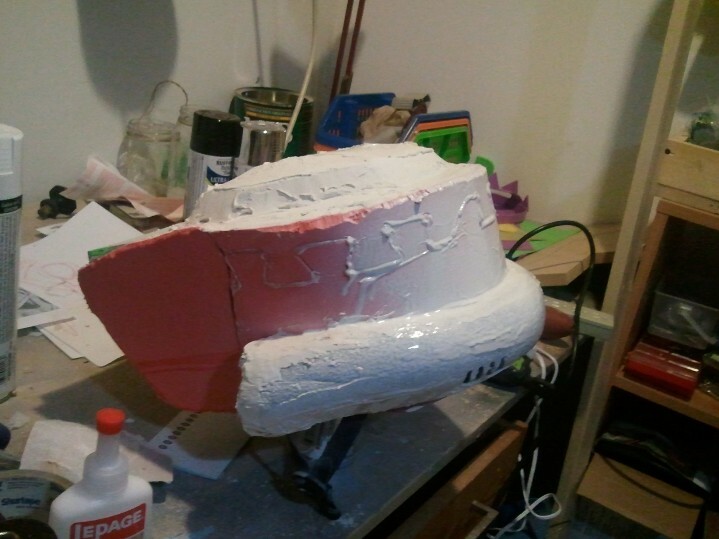 But the Cosplay bug bit a few years ago, once we had settled down into a house where I had a workshop to call my own. 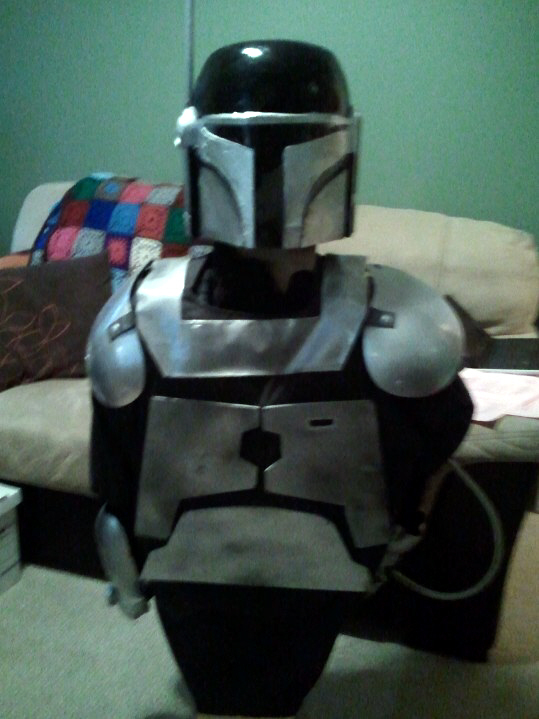 I made my Mandalorian helmet, using trial and error and error and error. 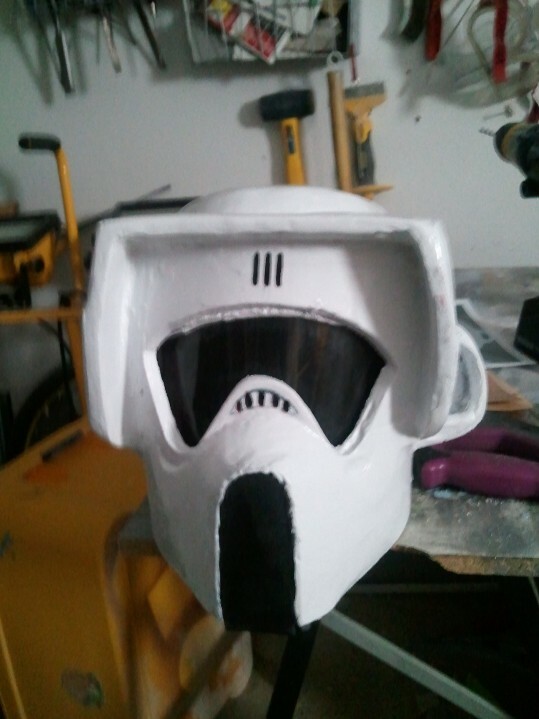 Once I’d stopped working on that (not once I’d got it right…I’m fairly realistic about my efforts here) I decided to tackle the Scout Trooper Helmet. 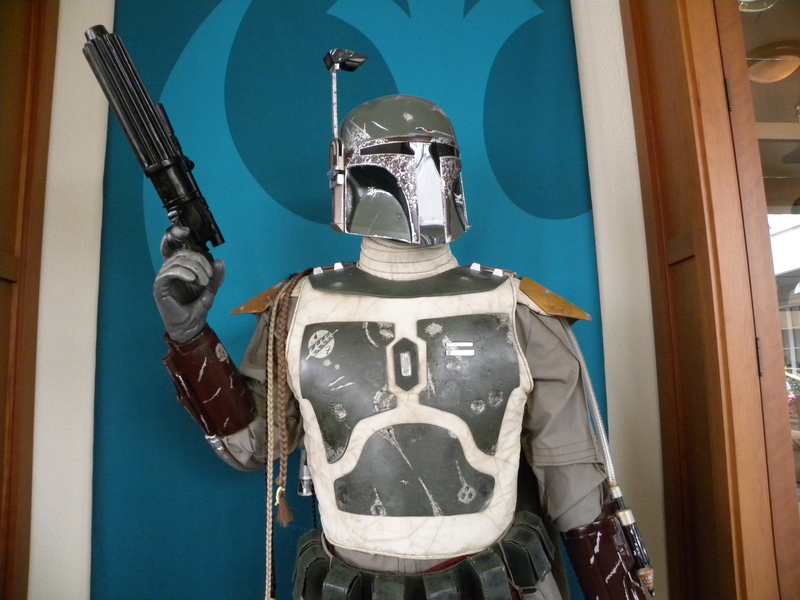 I don’t know why I coveted this particular helmet. It’s probably because “Return of the Jedi” was the first Star Wars film I saw at the cinema, and the Speeder Bike chase scene was burned onto my brain ever since. 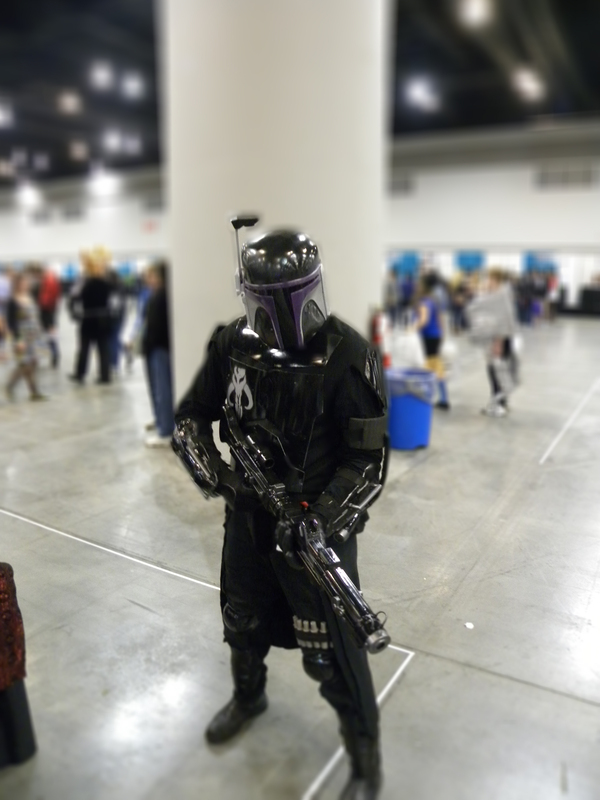 Remembering the frequent disappointments with the Mando helmet, I swore that this time I would take things slow. Not rush stages and spoil things. 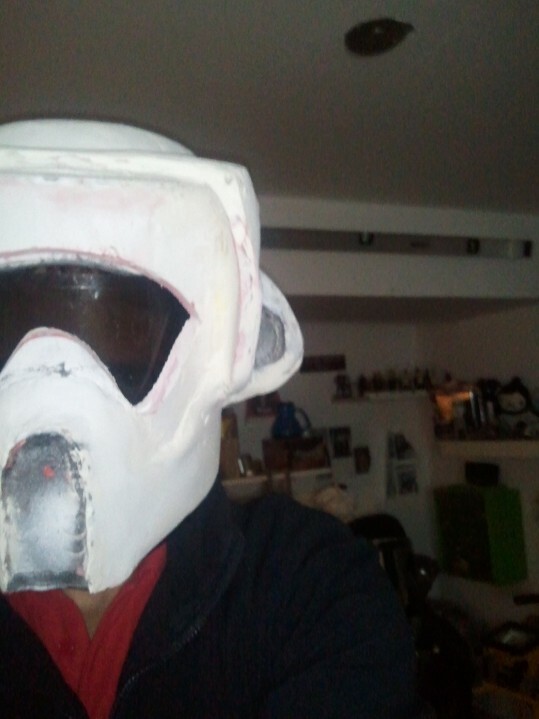 I found an old ski helmet at a sports sale and decided to use it as the base for the helmet. Then I decided the two other main materials were going to be the foam flooring tiles available in stores everywhere ($11.99 for four) and lots and lots of filler. 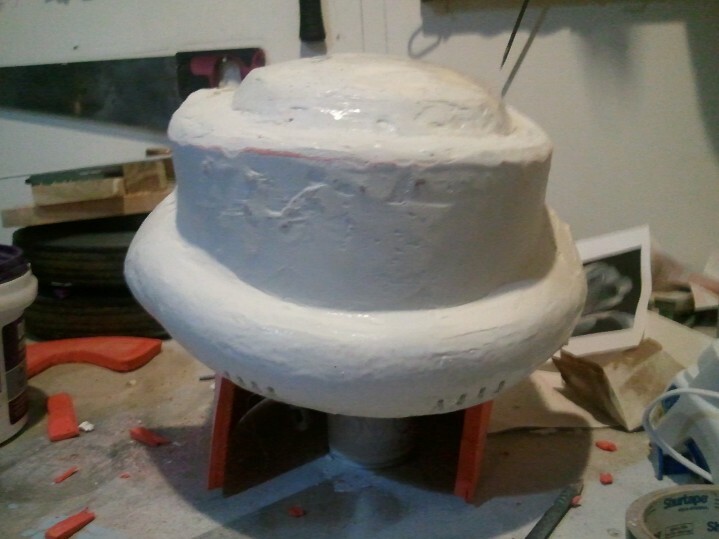 Filler can be bought in big tubs, it’s almost stiff enough to mould and hold a shape, and you can sand it smooth. If you have patience. 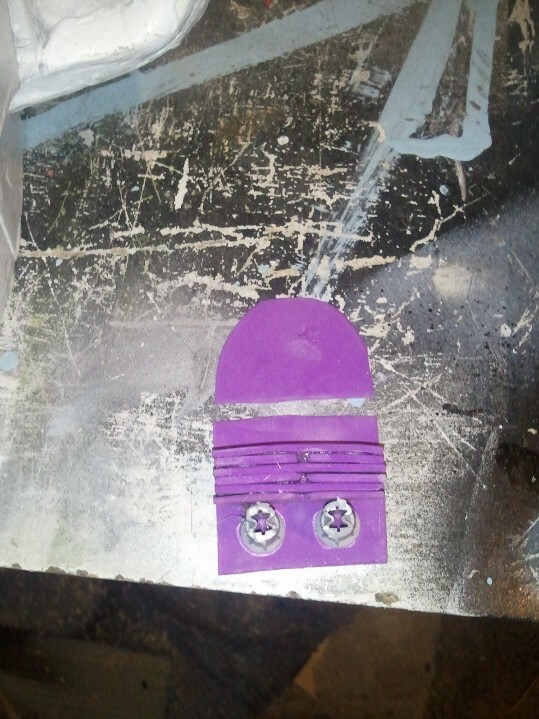 I cut a disc out of a flat piece of floor tile and settled it on the helmet, then replaced the disc to make the raised section on top. 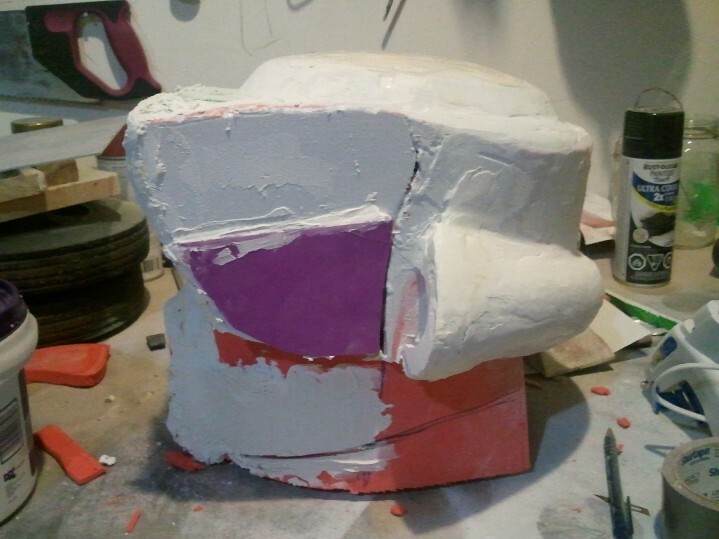 The side pieces are held in place by a foam insert (white). Filler round the top attempts to smooth things over. I used some pipe insulation to make the raised section that goes from ear to ear around the back. This is the first place where careful measurement and symmetry comparisons would have been good. The “jigsaw” lines are the result of using the straight edge of the floor tile, then filling the gaps in the jigsaw edge with glue. Amateur mistake. 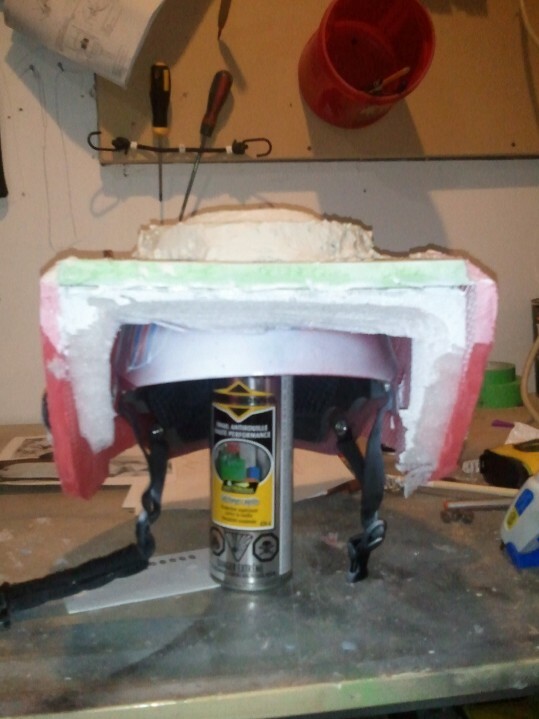 The glue resists sanding, either sticking to the sander, or melting and flinging glue everywhere. 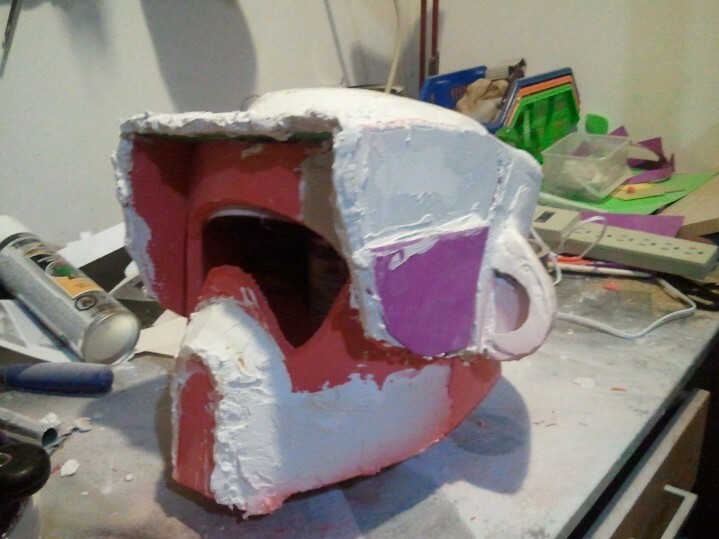 As usual with projects like this, I can’t help spraying on some paint in the hopes it will start to look really good. It never does. Heavy application of filler begins to cover over the glue jigsaw disaster. 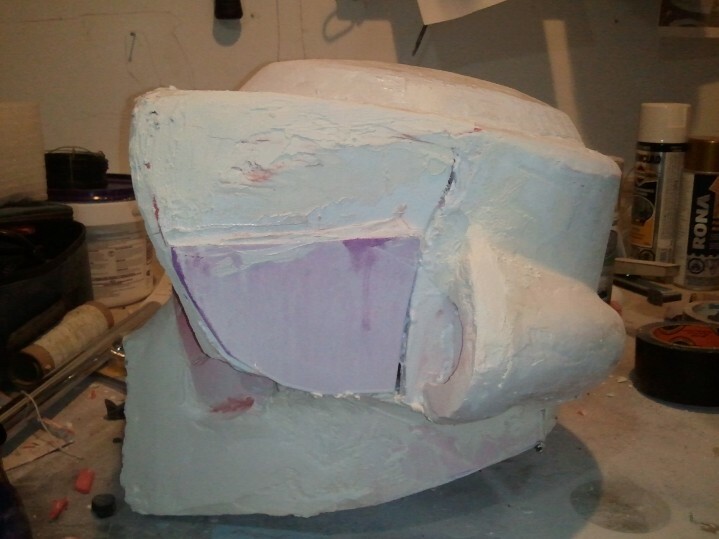 I start to use the filler to flare out the “ear” portions. 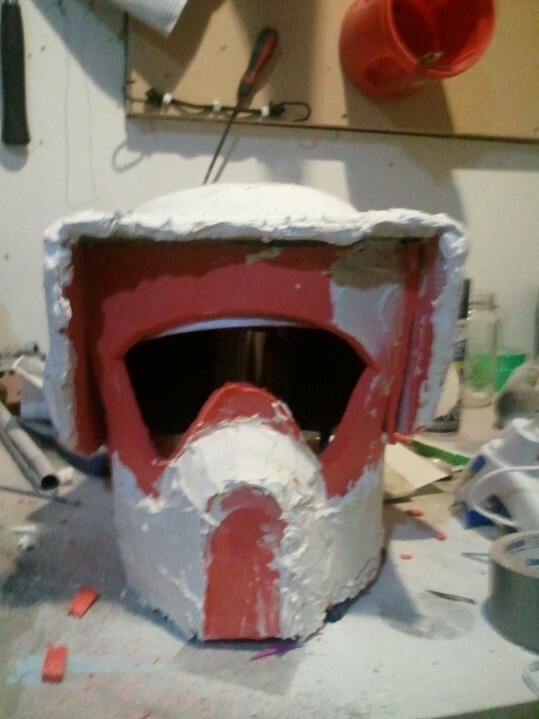 Again, I did this without carefully checking the various reference photos I have of the real helmet. 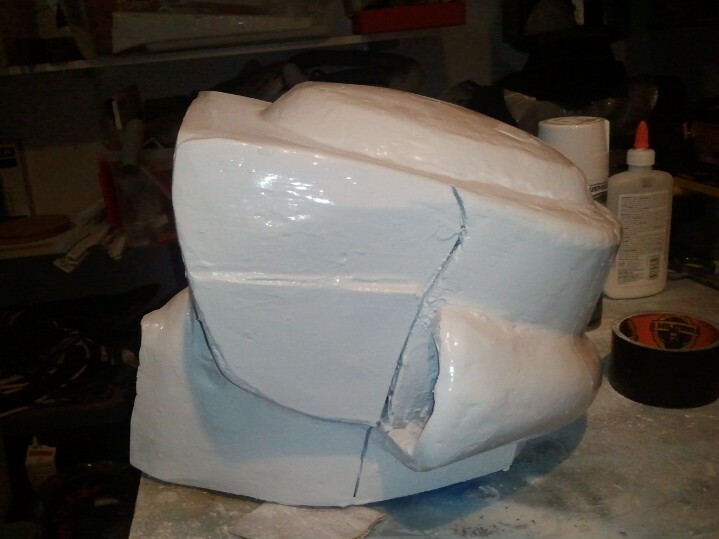 I removed the foam inserts and immediately saw that I hadn’t got the front cut straight, or attached evenly. I SHOULD have taken it apart then and there. Instead I decided to try and press on and fix it as I went. I was quite proud of this front piece. 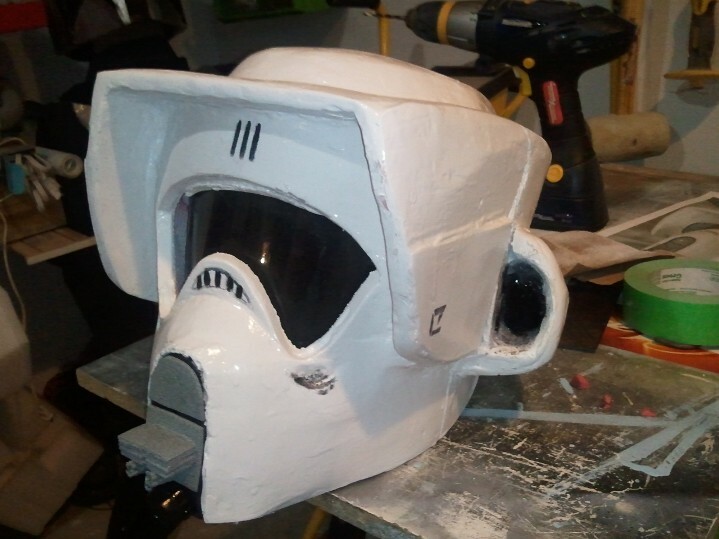 After so long staring at the cowling, it was nice to see the face of the trooper helmet emerge. 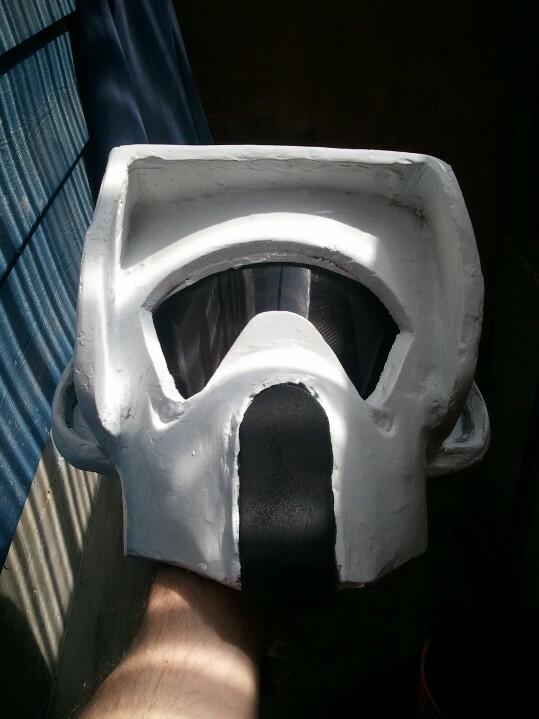 I cut the visor hole freehand, and did not use any measure referents. It is not even. I did have scalpel blades to cut the foam tile, but no scalpel to hold them in. This is not an optimal situation. 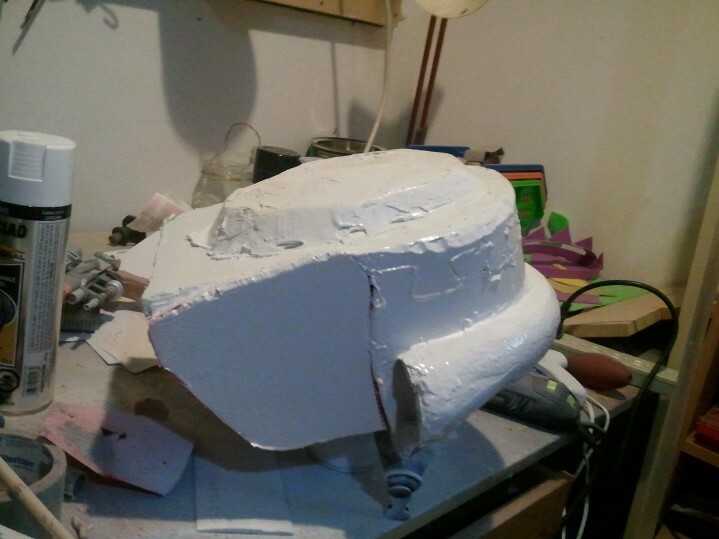 Adding more filler helped the shape of the face plate, and emptied the filler tub. Please don’t imagine this is taking place in one or two extended sessions. Each advance takes place over five or ten minutes grabbed here and there amongst other adventures. On the plus side, this means the filler dries before I attempt to ruin the next bit. 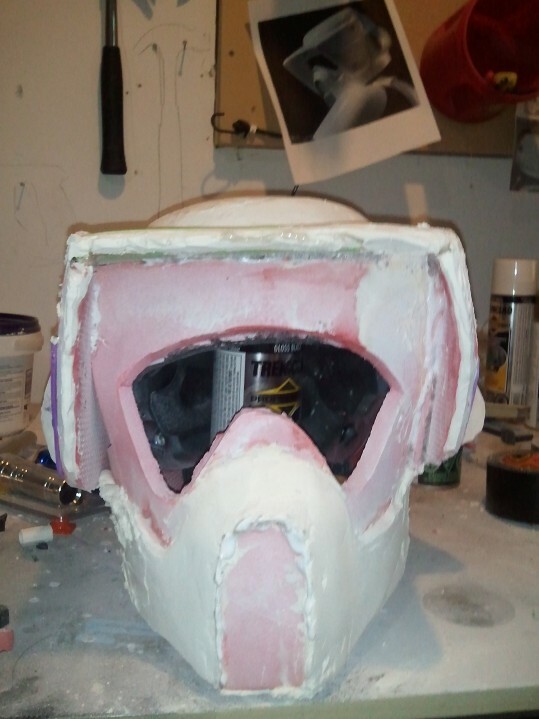 The faceplate is way too long, so I need to cut it down. Plus it doesn’t go all the way around to the back, so I have a piece to put in. 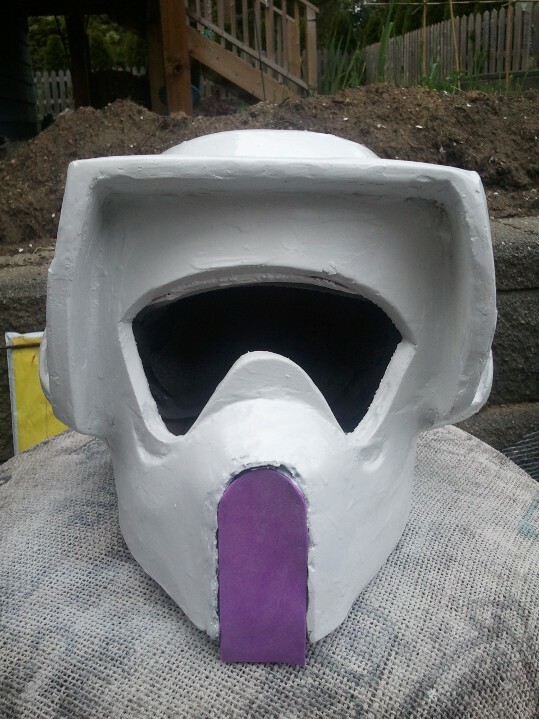 I added the purple piece because it’s raised detail on the actual helmet, and I felt putting in a piece of thin foam would be easier than sculpting it in filler. This shows the gap at the back that needed sorting out. 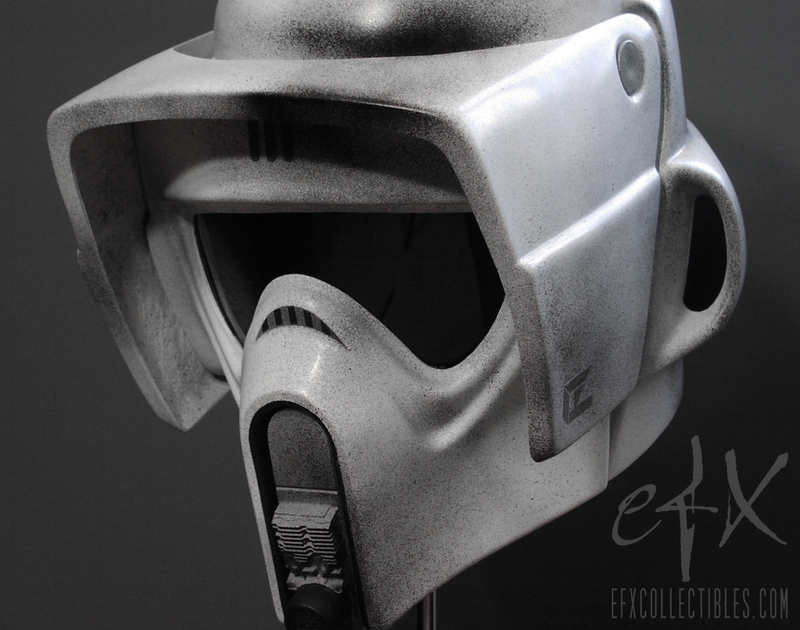 With the faceplate cut down, the helmet sits at a more pleasing angle. More filler and some determined sanding starts to get the right surface finish. I also cut and reshaped the corners of the cowl. It’s too high, but it’s the right shape. The reshaping has left one side looking oddly angled. Naturally, I tried adding paint to see if it helped. You can see how well that worked. 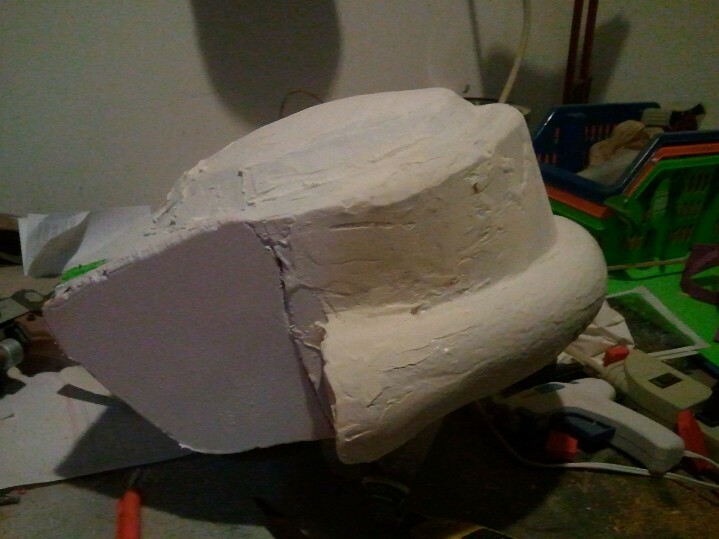 Shaping the snout was moderately successful, and actually, adding more paint makes the whole thing look more of a piece. The contour lines running out from the snout are wrong though, and in remodelling I’ll get them wrong in a different way. When I found the visor material (an old school binder cover) I couldn’t resist sticking it in temporarily and trying it on. It’s hard to see through, steams up, and is impossible to take selfies in, because you can’t see what you’re doing. 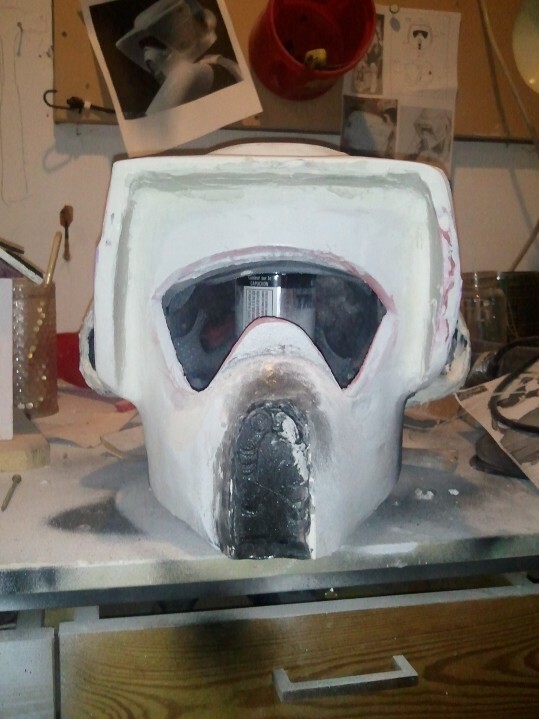 More sanding has improved the surface, but left the thing looking like it barely survived a fire. This shot shows how badly asymmetrical the faceplate is. 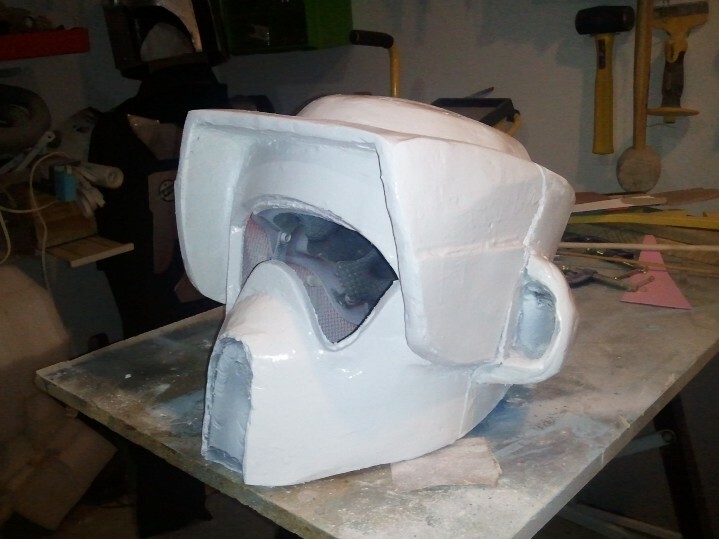 A devoted cosplayer would either start afresh, or tear the helmet down a few stages. I tried adding more paint. 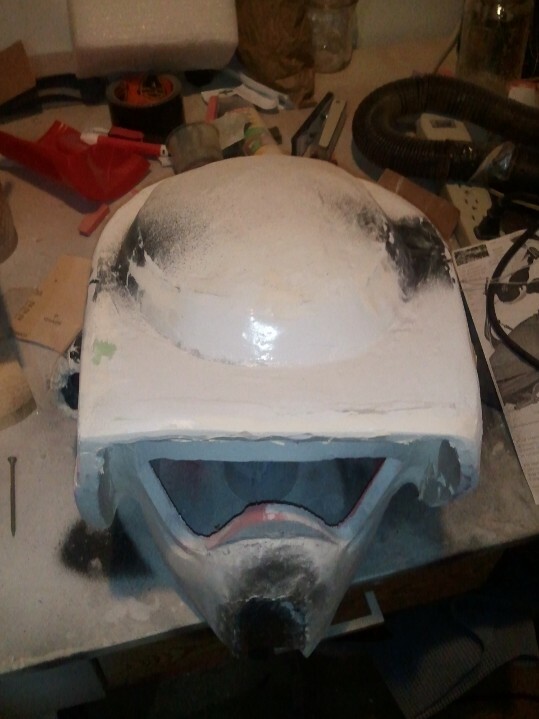 In the real helmet, that cut down the side is where the faceplate lifts up so you can put it on. That doesn’t happen with this one, but it still has to be there. Shots like this make it look pretty good. Mostly because they don’t include the reference photographs showing where I was going wrong. 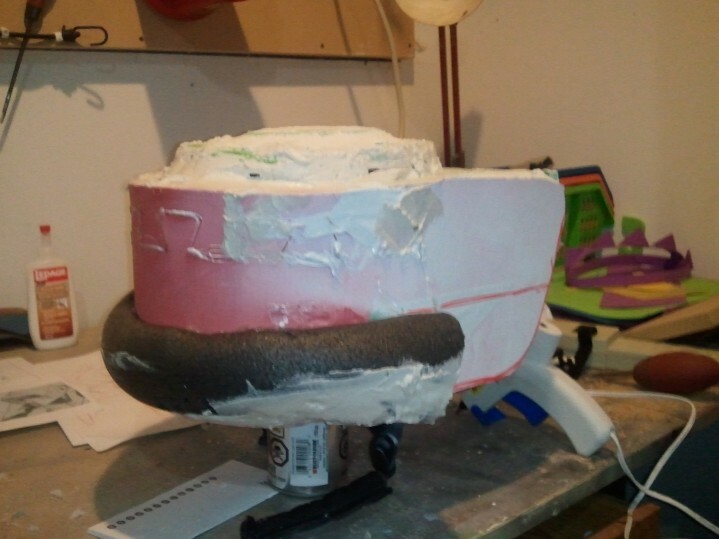 The surface of the snout wasn’t smooth enough, so I decided to add another piece of the thin craft foam. 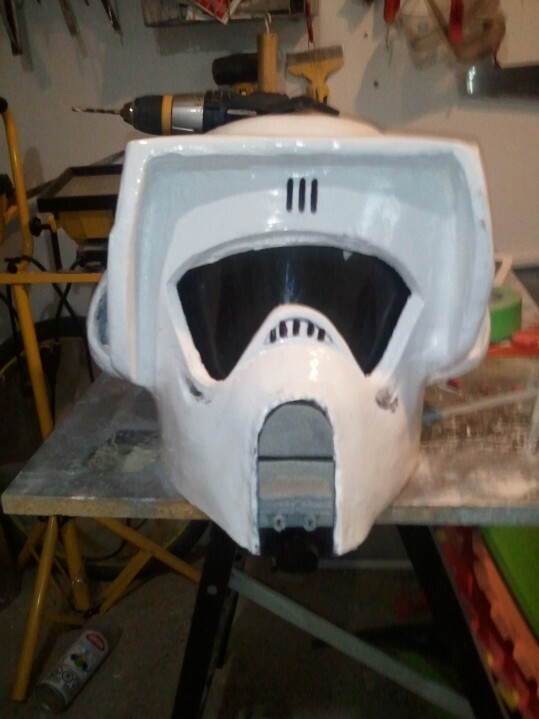 This picture is just checking the fit – I sprayed it black before gluing it in. Real dedication would have been continuing to sand and paint and sand and paint. 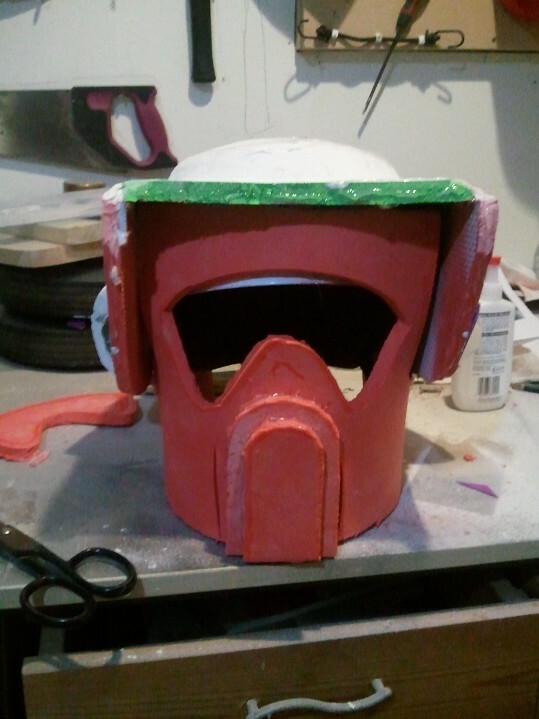 But I lost all patience and glued the visor in instead. 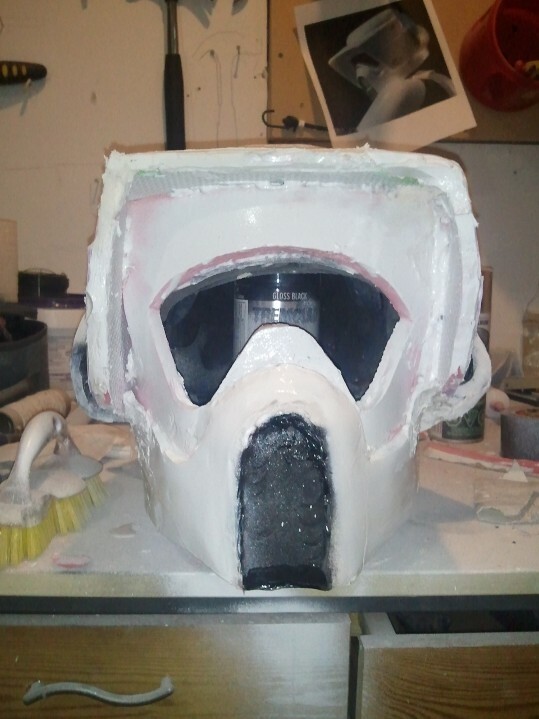 Now I couldn’t spray anymore, unless I went to the trouble of covering the visor. And you know how likely that is. Couldn’t resist trying it on. Vaguely reminded of Snoopy. With all work on surfacing pretty much abandoned, it was time to add on the little details. Measuring for pinpoint accuracy and comparisons with photo referents were just two things I didn’t do…. 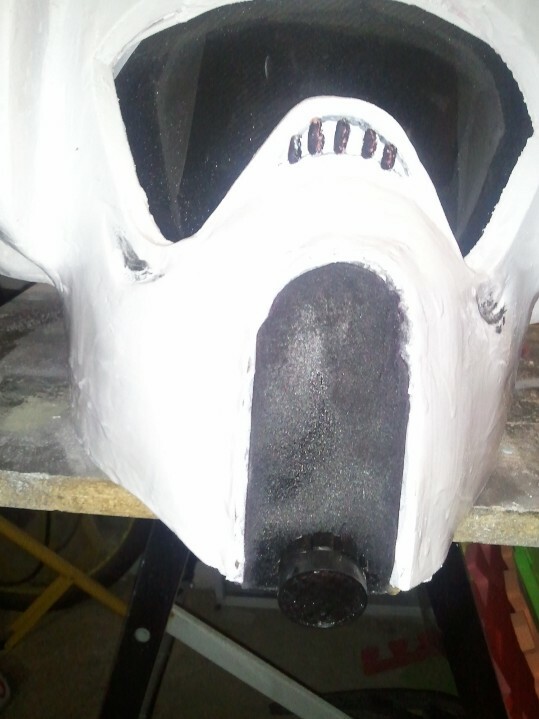 I added the “Enhanced comlink” piece to the bottom of the snout. Now I needed the extra pieces to complete the snout. Here, measuring would be vital to get them looking exactly right. But unfortunately, I didn’t do any. This whole project took around six months. Along the way, Mrs Dim reminded me that I’m not very good at this sort of thing, and I had a serious think about WHY I still do it. I can see the flaws in what I’ve made, even while I’m making it, but making it is something I enjoy doing. I don’t mind that I never get whole days to work on it. Probably wouldn’t enjoy it if I did. 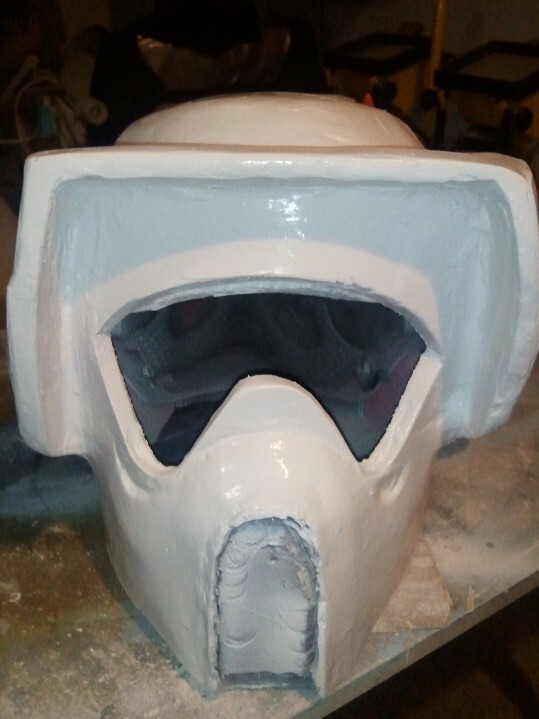 I know this is nothing like the 501st produce, but that’s ok too, because I don’t think I’m really doing this for the Cosplay aspect. It’s just something I do for me, something that isn’t writing, or cleaning, or cooking, or parenting. It may be less practical than knitting, less aesthetically pleasing than painting, but it’s my hobby. Any suggestions for my next project? 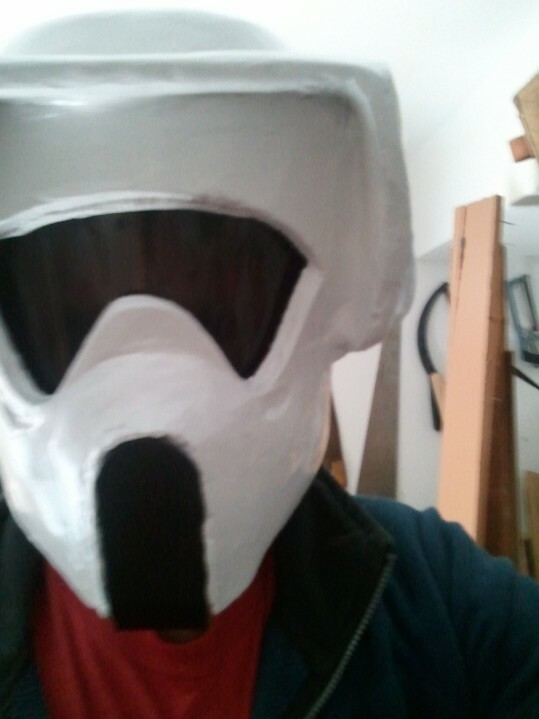 I quite fancy taking on a Clone Trooper helmet…..